The technology-driven hybrid power systems market is characterized by high initial investments and low switching costs. The abundant availability of component manufacturers as well as numerous government incentives have fueled the demand for and adoption of hybrid power systems across developing economies. The lack of grid connectivity in remote and rural areas and its sheer unreliability has boosted the installation of these power systems in recent years. The global hybrid power systems is composed of a handful of major players who have already established a strong foothold in the market thanks to their increased focus on innovation and technology. 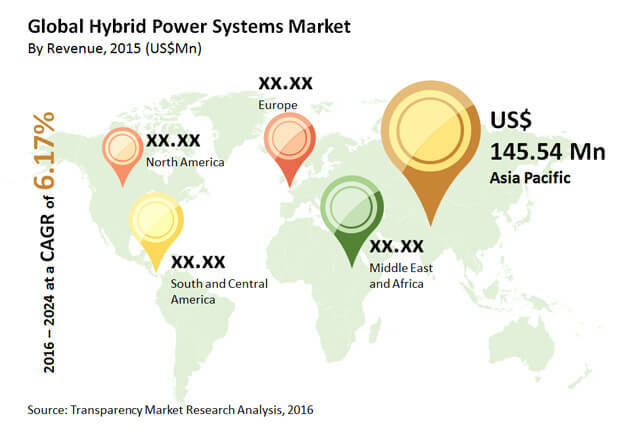 Fueled by the combined efforts of these companies, the hybrid power systems market is expected to develop at a CAGR of 6.1% between 2016 and 2024, with its valuation increasing from US$411.79 mn in 2015 to US$703.55 mn by 2024. Hybrid power systems combine renewable energy sources such as wind and solar and energy produced by conventional means such as diesel generators. By type, hybrid power systems include wind-solar-diesel hybrid, PV-diesel hybrid, and others such as wind-hydro-diesel hybrid, solar thermal, and hybrid-solar biomass. In 2015, wind-solar-diesel hybrid power systems dominated the overall market and although this segment is predicted to lose a slight share in the market by the end of the forecast period, it will retain its dominance over other segments. Over the past few years, wind-solar-diesel hybrid systems for rural electrification have been enormously developed by various stakeholders across developing countries such as Indonesia, India, China, and South Africa. PV-diesel hybrid systems have also been attracting significant funding from various agencies of late. The global market for hybrid power systems has been geographically segmented into North America, South and Central America, Asia Pacific, the Middle East and Africa, and Europe. Asia Pacific held the largest share in the global in 2015 and is projected to continue its dominance throughout the forecast period. Players in Asia Pacific can avoid transmission costs by setting up hybrid power systems as standalone mini-grids. The integration of renewable energy production with the electricity mix also reduces the cost of transporting fuel to remote areas in the region. Japan is the leading contributor in the APAC hybrid power systems market, with the surge in utility-scale and commercial projects expected to drive demand in the coming years. Over the past few years, the country has witnessed a rapid increase in the number of companies registering to sell retail power. This has further driven the hybrid power systems market in Japan. The Middle East and Africa region is the second largest market for hybrid power systems, fueled mainly by the rapid progress in South Africa. The mandatory implementation of the national policy on rural electrification across national electricity companies, regulatory agencies and commissions, rural electrification funds, and rural electrification agencies across Africa has served as a major driving force. In addition to this, the World Bank and the Asian Development Bank (ADB) in Africa fund various hybrid power projects for the implementation of PV arrays in existing diesel power plants. The research study is designed to analyze the global hybrid power systems market. The market is calculated in terms of revenue (US$ Mn) based on the annual sales of hybrid power systems. The market for hybrid power systems has been segmented on the basis of type, end-use, and country/region. The global hybrid power systems market, based on type, has been segmented into wind-solar-diesel-hybrid, PV-diesel-hybrid, and others. On the basis of end-use, the hybrid power systems market has been segmented into residential, rural facility electrification, and others. The regional segments included in this study are North America, Europe, Asia Pacific, Middle East and Africa (MEA), and South and Central America (SCA). These regional segments are further divided into country-wise segments. The report provides a detailed growth forecast for the 2016–2024 period, considering 2015 as the baseline year. Projections have been provided for revenue (US$ Mn) through the annual sales of hybrid power systems. The report includes the key market dynamics affecting the demand for hybrid power systems. As a part of our market dynamics analysis, we have analyzed the market drivers, market restraints, and market opportunities. A comprehensive competitive landscape, which includes company market share analysis and market attractiveness analysis, has also been provided in this report. The report also provides a detailed industry analysis of the global hybrid power systems market with the help of Porter’s Five Forces model. The Porter’s Five Forces analysis aids in understanding the five major forces that affect the industry structure and profitability of the global hybrid power systems market. The forces analyzed are the bargaining power of buyers, bargaining power of suppliers, threat of new entrants, threat of substitutes, and degree of competition. The study also includes the value chain of the global hybrid power systems market which provides a glimpse of key suppliers, manufacturers, and distribution channel as well as interaction of suppliers and buyers with end-users. The company market share analysis has been done considering the revenue and global penetration of key market players in the hybrid power systems industry. The market attractiveness involves benchmarking and ranking each technology and region on the basis of numerous parameters. The parameters selected are likely to have a pronounced effect on the demand for each technology in the current scenario as well as in the near future. Key participants in the global hybrid power systems market include Bergey WindPower Co., BORG Inc., Guangzhou HY Energy Technology Limited Corp., Kestrel Renewable Energy, KYOCERA Corporation, Panasonic Corporation, Schneider Electric SE, Sharp Electronics, Siemens AG, and Suzlon Group. This report provides an overview of these companies, followed by their financial revenues, business strategies, technical information, and recent developments.